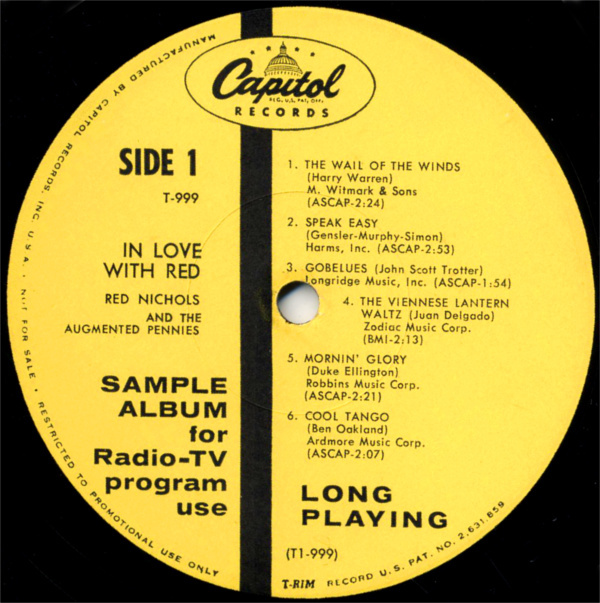 Capitol Records Label Guide: LP/12"
This is a label guide for Capitol Records LPs and 12" records from 1949 up to the 1990s, including the 10" LPs, manufactured in the U.S.A. (Most labels after the 90s are custom labels). 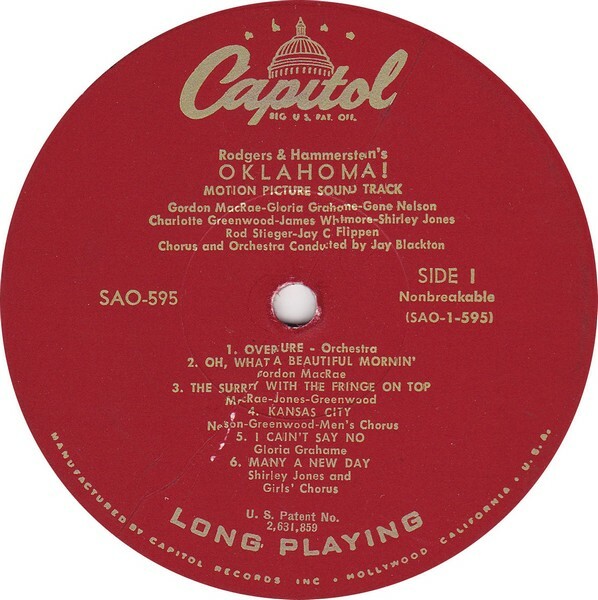 This is the very first LP label that Capitol used in February 1949 when it first started making LPs. This label has a silver band, typically around a deep groove in the label. 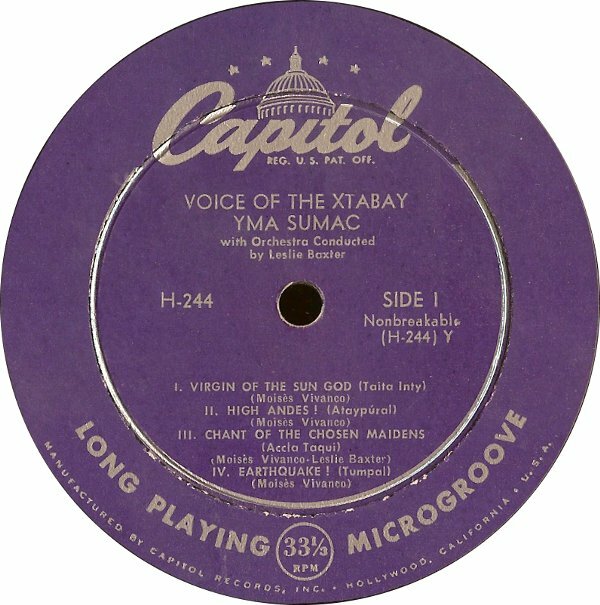 The text was silver and had the words "LONG PLAYING" and "MICROGROOVE" around a "33⅓ RPM" in a circle along the bottom of the label. 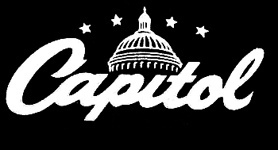 The rim text reads "Manufactured By Capitol Records, Inc. • Hollywood, California • U.S.A."
This label variation lasted from February 1949 until 1953 when the design changed slightly. This version comes in both red and purple colored labels. 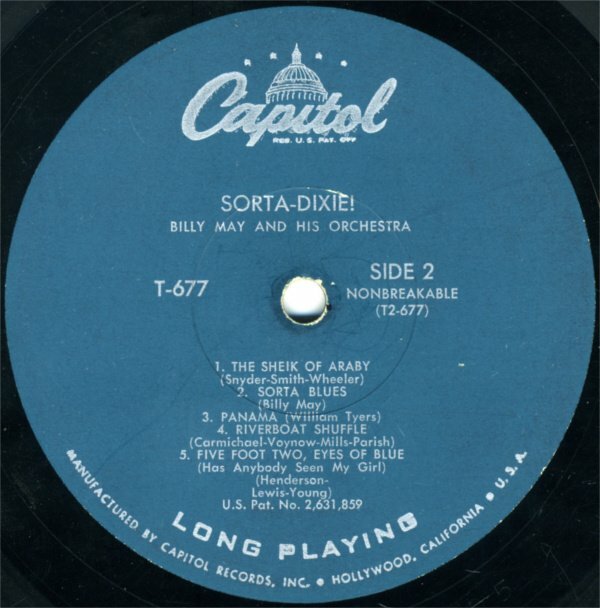 This is the second label that Capitol used, a slight variation from the first label. It was first used in 1953. This label had the same silver band as the first label, but did not always include a deep groove. However, the band is still located around the pressing ring. 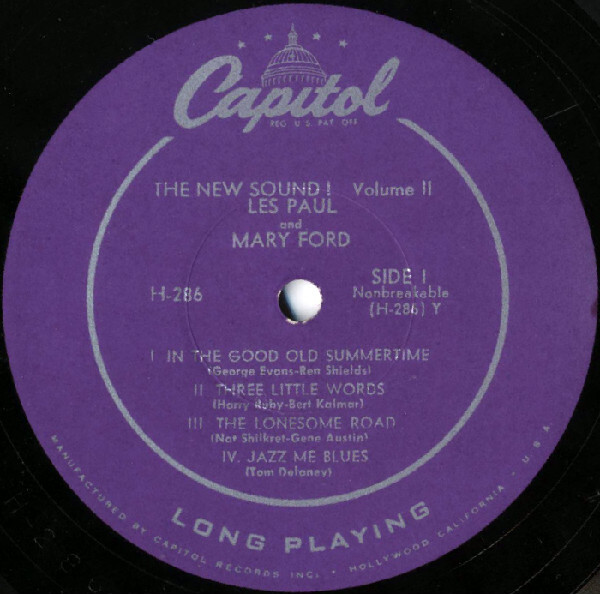 The label still had silver text (on most colors), but both "MICROGROOVE" and the "33⅓ RPM" in a circle were removed from the bottom of the label. 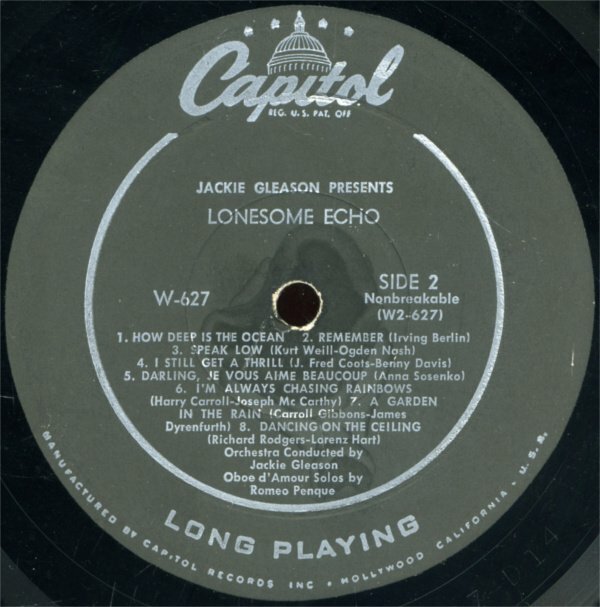 "LONG PLAYING" remained at the bottom of the label. This label variation lasted from 1953 until 1956, when the design was again changed slightly. This version comes in purple, black/gray, turquoise, red, an uncommon white version with purple text, a white promotional label with black text and a yellow promotional label, also with black text. 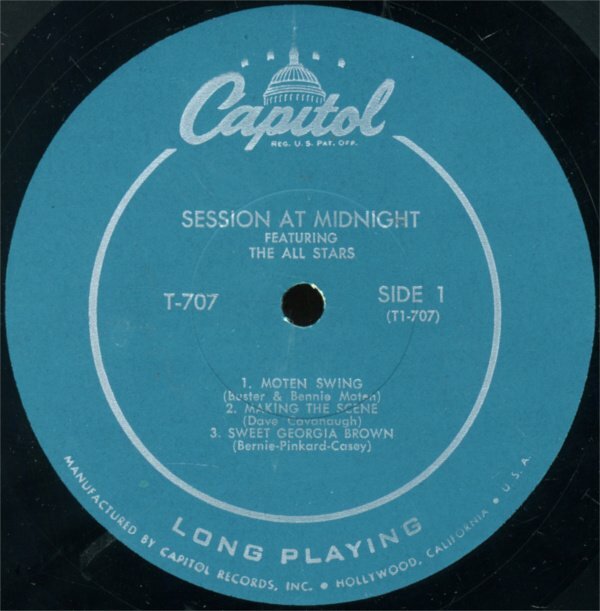 This is the third label design that Capitol used, which had some major changes compared to the previous labels, but had the same basic design and colors. This version had two variations that were used throughout the same period. Both of these variants lasted until 1958, when stereo first began to be used for major releases. This variant started around album T-700 (There may be some overlap between this label and the previous design). 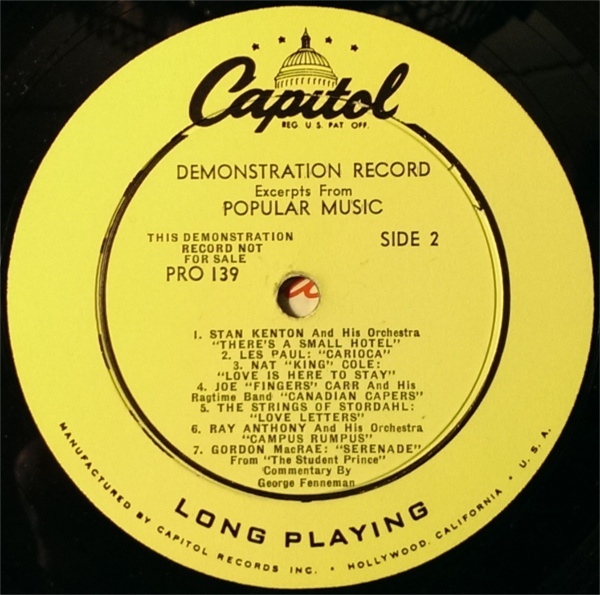 This variant had silver text on most of the labels (Red and Promo records had gold and black text, respectively), and the silver band was removed. "U.S. Pat. No. 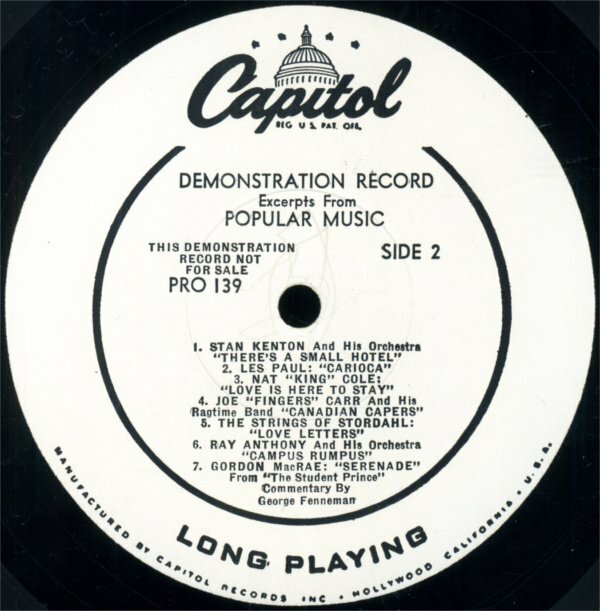 2,631,859" was added near the bottom above "LONG PLAYING" on most versions of Variant A. 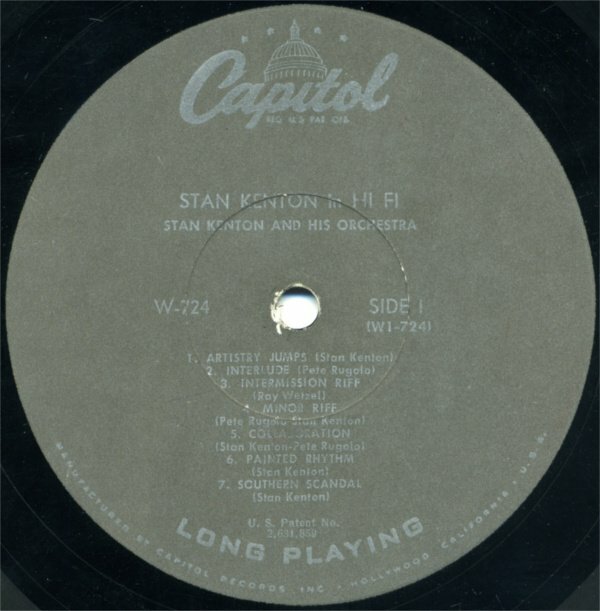 "LONG PLAYING" remained at the bottom of the label. This variant came in turquoise, red, black/gray and a white promotional version. This variant started a little later in 1956 and had slight changes at the bottom of the label. This variant had silver text on most of the labels (both a yellow label used for special releases and a yellow promotional label had black text), and the silver band was also not present. "U.S. Pat. No. 2,631,859" was moved to the rim text of the label. The rim text reads "Mfd. 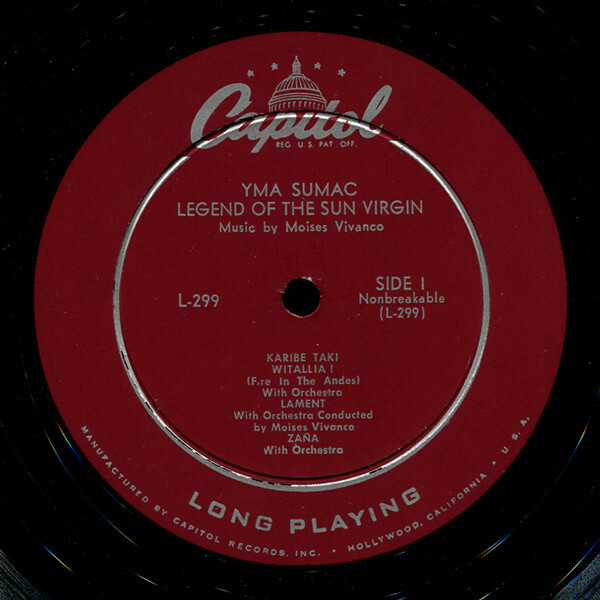 By Capitol Records, Inc. • Hollywood, Calif. U.S.A. T-RIM Record U.S. Pat. No. 2,631,859 • Trade Marks Capitol And FDS Reg. U.S. Pat. Off. 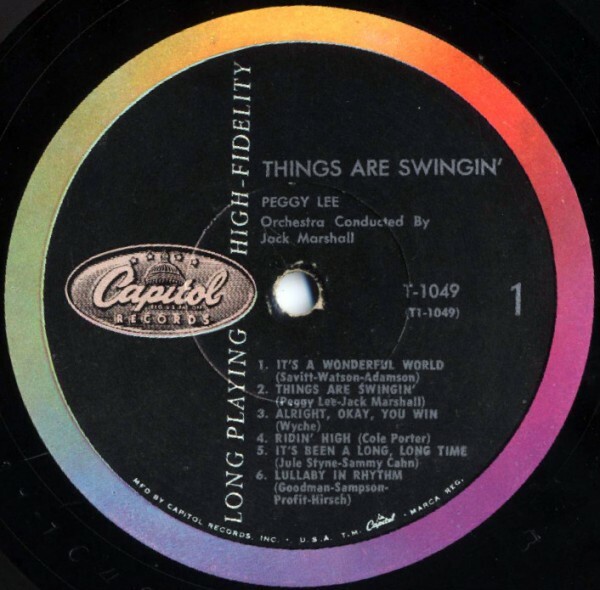 • Marcas Registradas"
"HIGH FIDELITY" was added to the right of "LONG PLAYING" at the bottom of the label. This variant came in turquoise, black/gray, a yellow label for special relases, and a yellow promotional label. This was the first rainbow label. 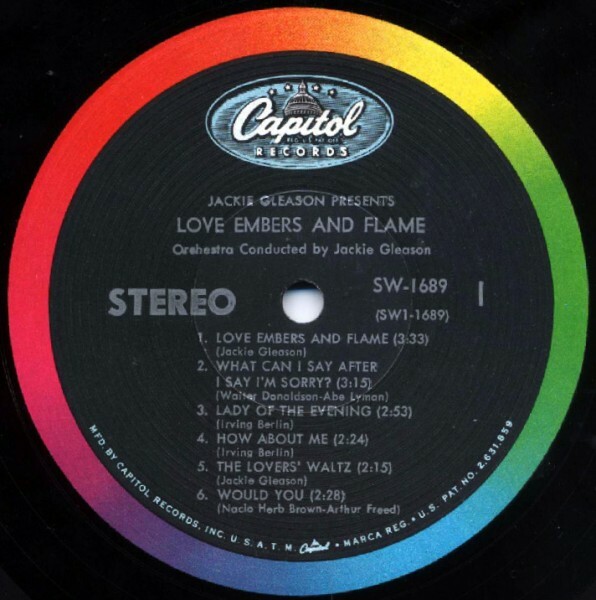 On this first label, the rainbow band used pastel type shades. "U.S. Pat. No. 2,631,859" was removed completely, as well as the FDS logo and T-RIM logo. "LONG PLAYING HIGH-FIDELITY" was placed vertically on the left side of the label, with a new, slightly changed Capitol logo separating it. 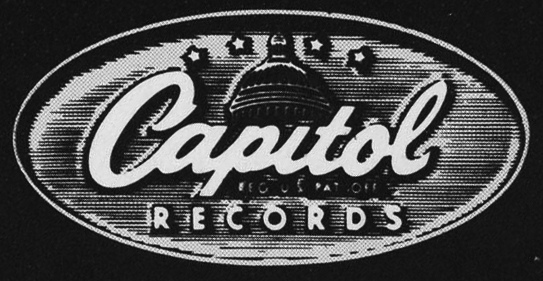 If the record was in stereo, "STEREO" was printed on the left side of the label, underneath the Capitol logo. The rim text reads "Mfd. By Capitol Records, Inc. • U.S.A. T.M. Capitol • Marca Reg." 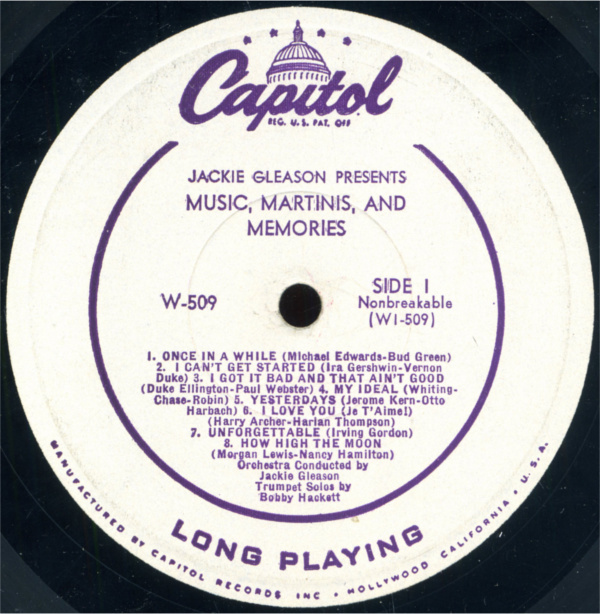 This label only had one version - Promotional, stereo and other special releases had print added to the usual label design instead of a different label design or color. This label design began in late 1959 and may have had some overlapping designs from the previous label. It started around album W-1221 and ended approximately around album T-1519. This was the second rainbow label. On this second label, the rainbow colors were brightened. 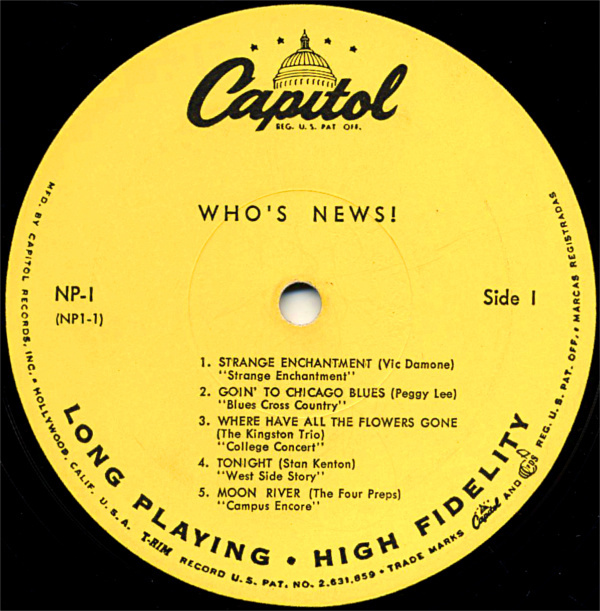 "LONG PLAYING HIGH-FIDELITY" was removed completely and replaced by "spires" in their previous location (around the Capitol logo on the left). "U.S. Pat. No. 2,631,859" was added back to the rim text. The rim text reads "Mfd. By Capitol Records, Inc. • U.S.A. T.M. Capitol • Marca Reg. • U.S. Pat. No. 2,631,859"
This label also had one version - Promotional, stereo and other special releases had print added to the usual label design instead of a different label design or color. 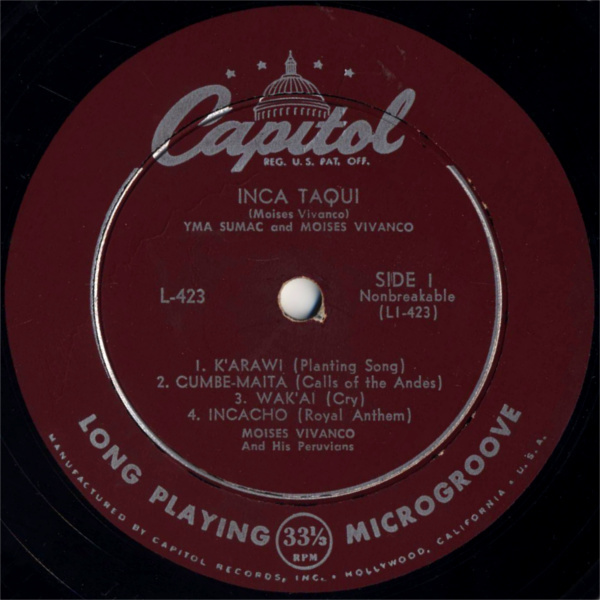 This is the sixth label design that Capitol used, and the third rainbox label. This version had two variations that were used - one before June 1968 and one from June 1968 to June 1969. Both variants shared a promotional label. 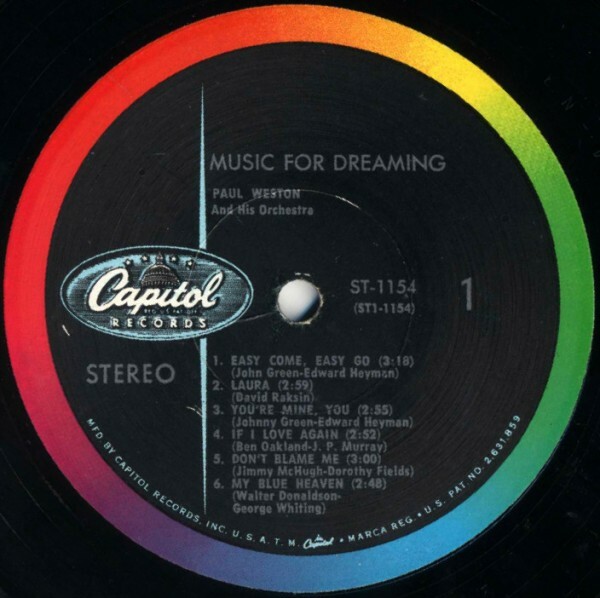 This variant of the third rainbow label was used throughout most of its run as Capitol's label design. It started around album T-1520 and ended in June 1968 with a small change due to a merger with another company. 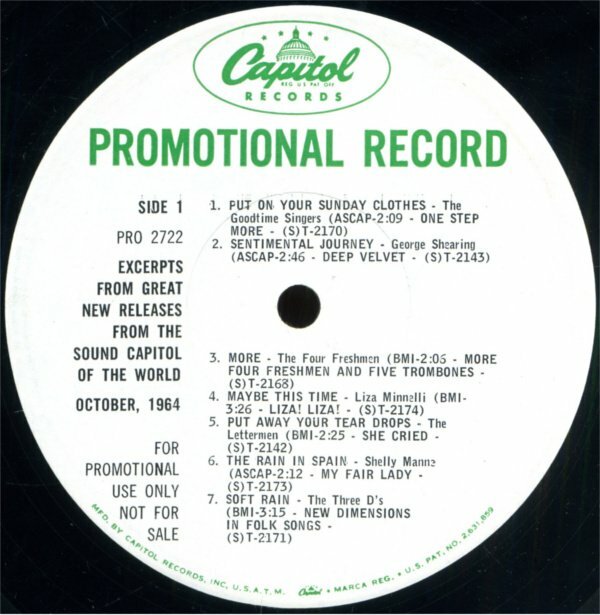 The "spires" were removed completely and the Capitol logo was moved from the left of the label to the top of the label. 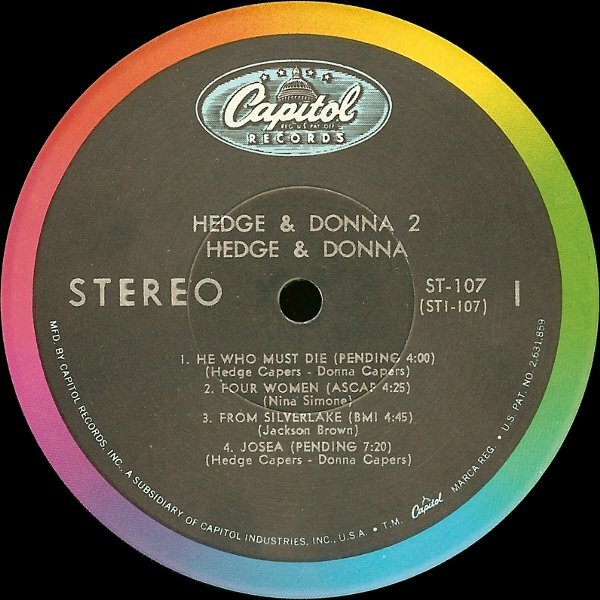 If the record was in stereo, "STEREO" was printed in the left side of the middle of the label, usually in between the album artist/title and track list. This label had one main version and a promotional version, which was the same across both variants (see above). 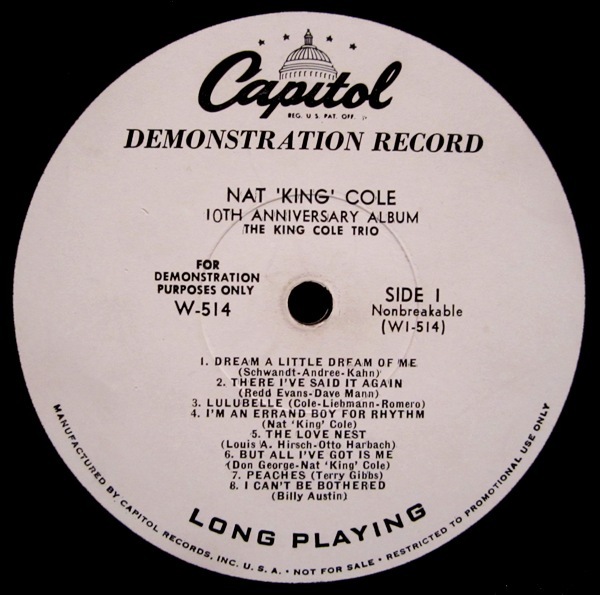 This variant was only used for about a year before Capitol's next major label change. Text was added to the rim text to indicate Capitol's merger with Audio Devices, Inc., forming Capitol Industries, Inc. It was used from June 1968 to June 1969. The rim text reads "Mfd. 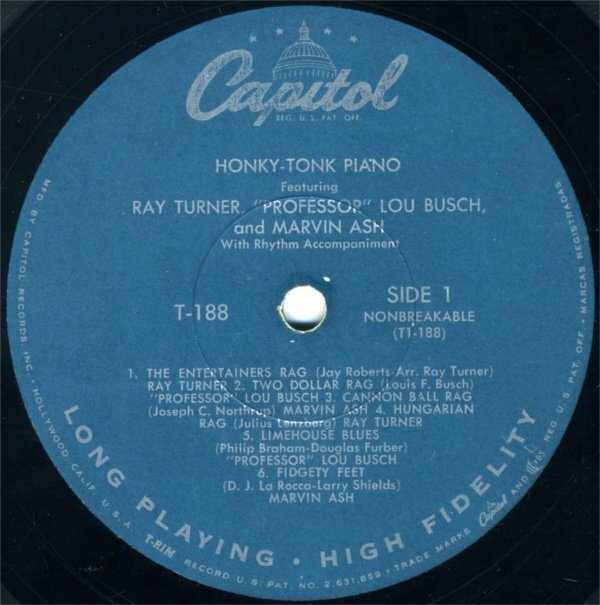 By Capitol Records, Inc., A Subsidiary Of Capitol Industries, Inc., U.S.A. • T.M. Capitol Marca Reg. • U.S. Pat. No. 2,631,859"